Nollywood veteran, Richard Mofe Damijo, known as RMD, is currently in the Turkish city of Cappadocia with Ovation boss, Chief Dele Momodu and the media personalities were given a rousing welcome in the city. As just a tip of the iceberg, the actor and his friends were greeted by a billboard erected for them. 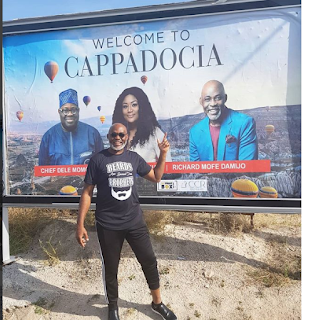 In elated spirits, RMD took to his Instagram page to gush over the kind of welcome he received in the city; Mommy, I made it, he said. “Oh wow Mommy see i made it. I am famous. There is actually a bill board welcoming me and my friends to the amazingly formed city of Cappadocia. Yet my hosts say this is just the beginning of many surprises to come in this holy city in Turkey. My Turkish diary starts now”.